In 2015, the Newsboys Foundation partnered with the Melbourne Recital Centre to create the Newsboys Foundation Regional Music Award. The award is part of the MRC annual Bach Competition. The Newsboys Foundation Regional Music Award seeks to address some of the issues affecting music students living in regional areas, including working in isolation and the added challenges associated with accessing learning opportunities. 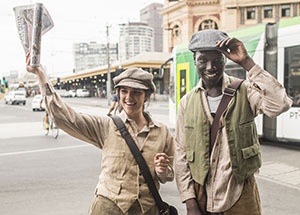 The award involves travel and one week’s accommodation for the student and a parent/guardian in Melbourne and a daily per diem; lessons with a top teacher on the relevant instrument; complimentary tickets to concerts at Melbourne Recital Centre during that week; mentoring/shadowing opportunities with Melbourne Recital Centre’s artistic and production staff; and the opportunity to go ‘behind-the-scenes’ with direct contact to industry professionals. The prize is applicable to entrants who live, and attend a Victorian Government school, in rural or regional Victoria to enable such students to benefit from musical tuition opportunities.